I freely admit that I know nothing about this Lew Chase / Azumi Bass other than the French eBay seller tells us that it is Japanese-made and dates from 1975. 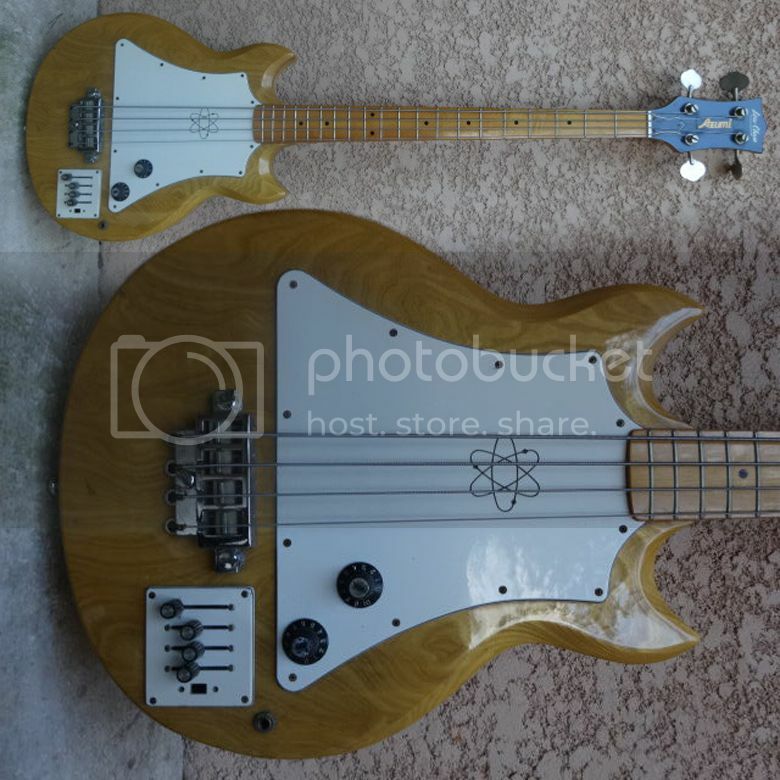 The design is reminiscent of the Gibson Grabber and Ripper basses from the same period, but most obviously it does not appear to have any pickups. Maybe it has magnetic pickups beneath the over-sized pickguard, or maybe this is an early example of a solidbody bass fitted with a piezo system and pre-amp - the unusual slider controls would lend credence to that possibility. If anyone knows anything about this bass or the Lew Chase and Azumi brands, please let us know via the comments below. Currently listed on eBay France with bidding currently at £201 at the time of writing and five and half days to go before the end of the auction. Labels: azumi, bass, Japanese guitar, pickups, Weird guitars, What's that guitar? It's VERY easy to forget when the archives are so big. But yes, that's one of Bertam's posts, one which I have no recollection of. It has piezo electric saddles. the sliders are volume controls for each string.